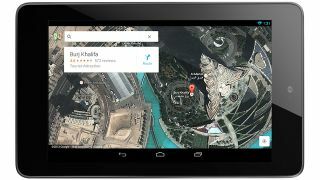 Google's major Maps update is currently making its way on to the Google Play store, bringing souped up traffic tools and new exploratory features with it. Although it's not actually available in the iOS App Store yet, the revamped app is based on the design of the existing iPhone Google Maps App. But it brings some new bells and whistles with it, including a dedicated tablet layout which should play nice with both Android tablets and iPads of all sizes. Navigational upgrades include traffic reports that give you more details of incidents ahead of you, plus a dynamic alert system that will let you know if a better route to where you're going becomes available - the latter feature is only on Android at the moment, although Google says it's "coming soon" to iOS. Also included in the upgrade are a couple of Google-friendly features like 'Explore' which pulls up nearby restaurant, bar, hotel and shopping options without you having to physically search for them. Zagat and Offers, both products from the Google stable, are also integrated into the new Maps, while Latitude and check-ins are on the way out. It's also goodbye to offline maps on Android - instead you'll have to type "OK Maps" into the search box when you're at the bit of the map you want to access offline - we're not really sure how this is better, but hey. It's Google's world, we just live in it. The new Google Maps for mobile is currently compatible with Ice Cream Sandwich and Jelly Bean Android devices, and anything running iOS 6 and above once it hits the App Store.